Confirming earlier reports that distressed California utility PG&E had rejected a proposal by some of the world's most prominent investors that would keep it out of bankruptcy, moments ago Bloomberg reported that the board of the embattled utility which is facing $30 billion in wildfire liabilities, voted late Monday to file for bankruptcy protection as soon as midnight. By rejecting the last minute rescue bids, PG&E - which was rated investment grade as recently as a few weeks ago by both S&P and Moody's- is set to file one of the biggest U.S. utility bankruptcies of all time, with over $30 billion in debt about to be in default. The company which serves 16 million customers, said a Chapter 11 filing is the only way it can handle the crippling costs of 2017 and 2018 wildfires that its equipment has been blamed for igniting. Since November, when California was hit by the deadliest fire in its history, the company has seen its shares plunge by 75 percent and its credit rating cut to junk. By going from investment grade to bankruptcy within one year, PG&E will be what BofA recently dubbed not a "fallen angel" but a "failing angel", representing a singular event: when it files for bankruptcy some time in the next 12 hours, PG&E will become the third largest IG default since 1999, behind Lehman and Worldcom, with $17.5bn of index eligible debt. 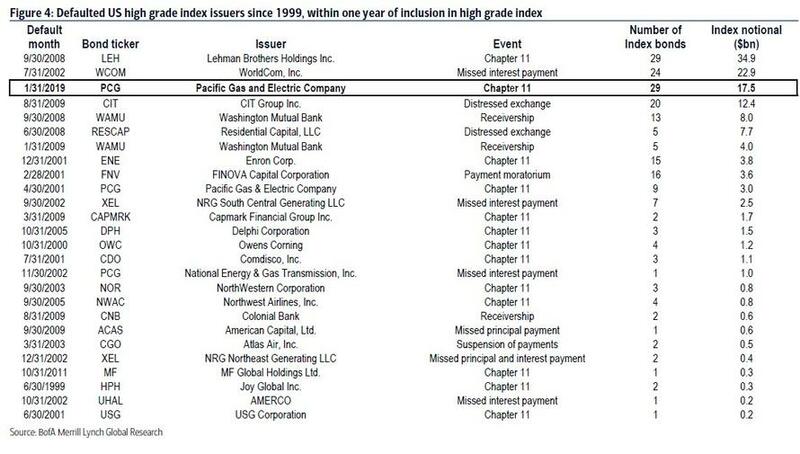 By filing before the end of the month, PG&E joins an exclusive group of formerly-IG companies, including Enron, Lehman and MF Global, that defaulted directly out of IG, before making it into the HY index first as Fallen Angels. The last minute investor proposals to provide PG&E with emergency funding were spurred by last week’s surprising finding that PG&E wasn’t responsible for 2017's Tubbs Fire, the deadliest of the Wine Country blazes that tore through Northern California. The goal was to buy PG&E more time to seek relief from wildfire claims, perhaps through an act by state legislature, according to the people. In the end, however, it was not enough. The PG&E board vote followed a decision by California utility regulators to approve a waiver allowing PG&E to access $5.5 billion of debtor-in-possession financing, which is necessary to allow the company to operate under Chapter 11 protection. Bankers have been seeking to offer parts of that financing to investors, and after meeting resistance from some potential lenders, were still poised to sell the debt, Bloomberg reported. And while it is unclear how many bonds PG&E's various investment consortiums own, one clear loser is BlueMountain Capital, which similar to Baupost, bought PG&E shares right before the stock collapsed, and challenged the California power giant’s plans to seek bankruptcy protection. In an open letter to PG&E’s board, it said there is “overwhelming evidence” that the utility holding company is solvent -- and that a bankruptcy filing is “damaging, avoidable and unnecessary." In retrospect, it may have also been inevitable, and the result will be tens of millions in losses for BTFDers like BlueMountain. In a regulatory filing, BlueMountain also cited a PG&E form 8-K earlier this month in which the company said it could shore up liquidity by using its assets to secure more capital, or access alternative capital. A spokesman for BlueMountain declined to comment on whether the firm is working with either of the rival financing groups. Meanwhile, oblivious to the demands of its vocal shareholders, PG&E is already preparing for life under bankruptcy protection with Reuters reporting that the company is set to hire turnaround specialist James Mesterharm as its chief restructuring officer to help the company navigate bankruptcy proceedings. Mesterharm, a managing director at AlixPartners, previously served as restructuring chief at Eastman Kodak during its bankruptcy proceedings, and also advised General Growth Properties and Zenith Electronics during their Chapter 11s. He has advised PG&E in the weeks leading up to its anticipated bankruptcy filing, Reuters said.